A wheelchair ramp is an absolute necessity if you use a mobility aid like a wheelchair, scooter, powerchair, rollator, or even a walker. You can probably get away with just a few steps if you have a walker and someone to help you transport it up the stairs. Without at least a temporary or portable one, you would need to get your walker up and down the stairs. Trying to do this alone, is not very safe, though possible, if you take your time. It's best to have someone help you, at least spot you so that if you lose your balance, they can be there to catch you. Whenever Cir uses his walker or rollator, I'm usually right there in case he gets a little wobbly. We rented one apartment which was supposed to be handicap accessible. We asked them to put in a temporary wheelchair ramp, which they never did. We had to carry the scooter down the two front steps, each time he wanted to use it. Not cool. They wanted us to put in the ramp using our resources. This never happened either. We filled out applications and never heard anything back. The only thing accessible about the house was that it was all on one floor. Nothing else was accessible. The doors were too narrow. The bathroom was too small. The bedroom and living room had carpeting. And there were stairs at both entrances. the kitchen was small and not accessible either. We were not happy with the situation or the landlord for not taking care of it. We ended up getting a call to move into a place we had been waiting to hear from, so everything worked out. After moving out and coming back a few years later, we saw that the landlord had finally put in a ramp. Figures, right? A built in ramp is one that is planned before building the house. 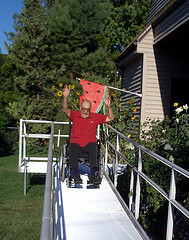 The ramp was part of what's called a barrier free design. The entryway would have a gradual incline to the door with nothing to hender a wheelchair or other mobility aid. This is much easier accomplished in a new build. To make modifications to an already built home would require a different type of design depending on how many stairs there are. If there are only a few, a ramp would be easier to add. The higher the stairs or the more stairs there are, then the more difficult the project or modification. An add-on ramp is one that would need to be built on to an already existing home that needs modification in order to make it more accessible. Measuring from the threshold to the ground, figure out how high the ramp will need to be. One source says that for every inch, you will need 20 inches in length or 1:20, to make a safe gradual slope for wheelchair access. Another says that the ratio should be 1:12. This type of ramp can be attached directly to your home. You can use materials that compliment the look of your house because this is meant to be a permanent addition. You would probably do this type of modification along with others so that you can remain in your home. The cost of these changes or additions will most likely be much less than finding and moving into another place or having a completely new home built. It is more cost effective to do it this way if you like where you are and don't want to relocate. Of course if you had always planned to move, then by all means do so. Make sure to do your research and purchase something that is already handicap accessible or can easily be made more accessible. We lived in a house once where there was a ramp that was very steep. It was not compliant according ADA standards. On top of that, there wasn't even a handrail on one side. the landlord did install a railing, however, it still was very steep. Needless to say, we didn't stay there very long either. A temporary ramp can be purchased, assembled, and temporarily attached to the molding of your entryway. These are usually made of a lightweight and sturdy material such as aluminum. It is attached in a way that is safe, but can be removed when you either decide to move or don't need it anymore. It still needs to be ADA compliant, meaning it needs to be the correct length according to the height of your threshold. Sometimes a bend or curve needs to be included in order to achieve the correct length and a gradual enough slope. This temporary alternative is perfect if you live in a rental or any place where you know you won't be staying permanently. It can easily be uninstalled, taken apart, and re-attached at your new residence or stored until you need it again. A portable ramp is just that, one that can be taken apart, folded up, and put away until you need it again. These are usually lightweight so that you can easily move it from place to place or set it aside until it's needed. This type of ramp is good when you only have a short rise to your threshold. Maybe there is only one step or a molding that makes it difficult to get in and out of your home. A portable ramp is the perfect solution to this problem. You don't need to alter your home by adding on to it. You just unfold the ramp, place it on the threshold, making sure it is securely in place and you're good to go. When you're done, just fold it up and set it to the side. There may be other solutions to the problem of wheelchair ramp access. Or the above types may be known as something different. These are just the terms I use to keep them straight in my head. 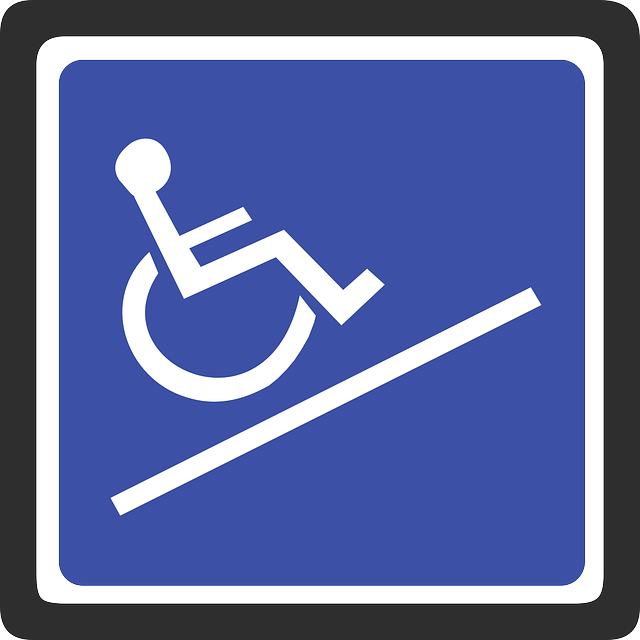 If you know of other types of wheelchair ramps, feel free to add a comment below and tell us about it. Here's a tutorial for building a wooden wheelchair ramp on to your home by Lowes. It gives you all the details, from materials, to measurements, to design specifics. Hope it helps if that's something you want to do.